MA: Last year you did the Summer Slaughter tour across North America, and you toured with a bunch of bands who play new styles of extreme metal these days. Some of them headlined over you. Was it a challenge to go out there and win new fans on every night of that tour? 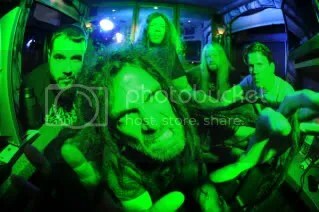 MA: Six Feet Under has invariably played a slower, more groovy style of death metal. Do you think that separates you from the other bands that started out around the same time as when Six Feet Under did? MA: Right, and because of the brutality of the music, does that put pressure on you as a lyricist, to come up with stuff that is as intense as the music itself? 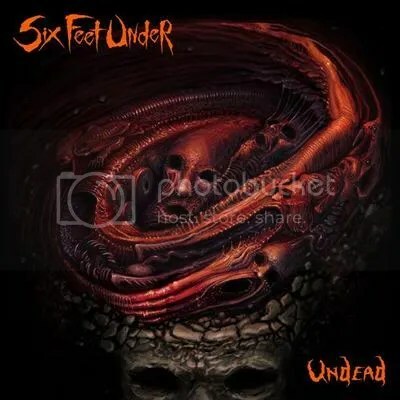 Six Feet Under recently unveiled the first single from their forthcoming studio offering, Undead. Slated for North American release on May 22nd through Metal Blade Records, the 12-track recording was produced by Mark Lewis (DEICIDE, DEVILDRIVER) and mixed by Jason Suecof (WHITECHAPEL, JOB FOR A COWBOY), at Audio Hammer Studios in Sanford, Florida. Led by the inimitable Chris Barnes, possessor of one of the most dominant and instantly recognizable voices of the death metal genre, Undead offers up an overhauled lineup. Now featuring Barnes alongside new guitarist Rob Arnold (ex-CHIMAIRA), longtime guitarist Steve Swanson, new bassist Jeff Hughell, and drummer Kevin Talley, whose history blasting for DYING FETUS, MISERY INDEX and Chimaira speaks for itself, Six Feet Under 2012 finds the band reinvigorated and churning out some of the most visceral, in-your-face, and downright horrifying tunes in their renowned discography of brutality both, lyrically and musically. Six Feet Under recently announced a bout of US live rituals this June. Dubbed the 18 Nights Of Blood Tour, the bestial invasion will begin in Atlanta, Georgia on June 8th and ravage its way across the country before coming to a close on June 29th in Tampa, Florida. Support will be provided by DYING FETUS and REVOCATION.